Michael Daves has crafted the definitive bluegrass singing lesson series with hundreds of online videos. Students access in-depth vocal instruction which includes harmonizing, vocal solos and singing tips. Learn how to sing from an amazing bluegrass musician. What ultimately sets these bluegrass vocal lessons apart from other offerings is the ability to submit a video for review using the ArtistWorks Video Exchange Learning® platform. Michael reviews each submission and records a video response, offering specific guidance to take your singing to the next level. All students can access the Video Exchange library and watch each other’s interactions with Michael. This library is constantly expanding and may contain the key to unlock your potential. 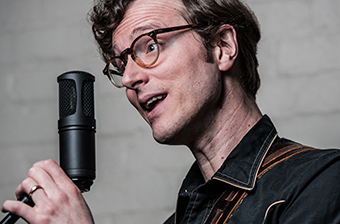 Michael Daves is a great talent with a very classic approach to bluegrass vocals. He's collaborated with legendary artists who include Chris Thile, Steve Martin, Rosanne Cash, Tony Trischka and a whole lot more. His first album with Chris Thile (“Sleep With One Eye Open”) was recorded live to tape over the course of four days at Jack White’s famous Third Man Records in Nashville and was later nominated for a Grammy. The New York Times calls him “The leading light for the NY bluegrass scene.” Michael is also a talented guitar player and sought after teacher teaching people of all vocal ranges and abilities how to sing bluegrass. He has been teaching with ArtistWorks since 2016. The instruction in the Michael Daves vocal school is well thought out with each lesson building on the previous one. Not only is it a vocal school but you get to brush up on guitar skills as well. His lessons, without wasted talk, put the student right to work. The extra videos and interviews with musicians are an appreciated added bonus. Michael clearly has a grasp of what is needed to be an educator. I am enrolled with both Michael Daves and Bryan Sutton. What is true for both of them is that in addition to being fabulous musicians, they are serious teachers. If you put in time with either of these courses, you will get remarkable returns for your investment. Do your music learning a massive favour, and join artistworks! Artist works provides an amazing format. A student can spend hours going through the curriculum and practising in a systematic way. The curriculum makes sense; it builds progressively from foundational lessons to lessons that are more elaborate. There are guests and additional material from festivals added regularly. The opportunity to converse and demonstrate one's skill level with the Musicians / teachers is invaluable. In my experience both Michael Dave's and Bryan Sutton are incredibly engaging, attentive to detail, supportive, and just generally awesome people to exchange videos with and to learn from. I have thoroughly enjoyed my Artistworks, Bluegrass Vocal class. Have learned a lot about singing and playing while I sing. My friends have commented on improvement in my singing now, so it must be working. Only concern is the difficulty navigating the web site, but it is getting easier to do. I have been working on my lessons, but don't have time to do videos and stuff. These guys are true artists, and i have learned a lot.